Oh this was great! And as so often - the ones that sound least appealing to you are often the best recipes. It was not really "not appelaing" to me but it did sound kind of boaring. 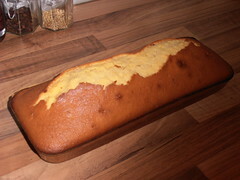 Lemon Loaf, ok. But the resulty... yummi! It was very easy in the making. I slightly reduced the amount of melted butter but kept the rest just as foreseen. Finally I did end up with a very moisty loaf cake, that had a perfect texture - soft, but dense enough to cut slices. And the taste was incredible! Three zested lemons make all the difference to an ordinary loaf cake. If I were not that lazy I would have made an lemon icing (or white chocolate?) to dress it up. But I am. Lazy. Because it's so easy and in the end so tasty this is really a keeper. What else can you ask for from a cake? For the recipe have a look at our TWD-host's pages (Truc of Treats and Michelle of The Beauty of Life - both with wonderful pictures!) or open the book Baking with Julia by Dorie Greenspan on pp 252/253. Lazy is ok. :) Cake looks fine on its own. Wonderful that you enjoyed this loaf!